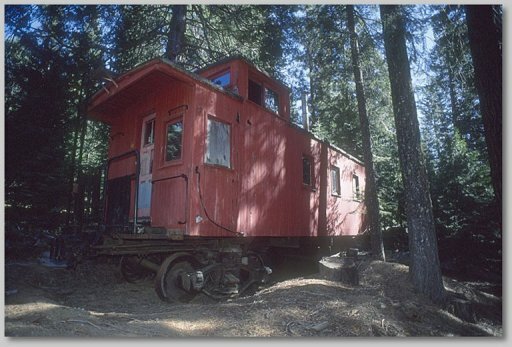 The first railcar brought to Black Butte was an historic Great Northern wood caboose, rescued from the woods outside Mount Shasta where it had been slowly deteriorating. Since June, 2007, when we moved the caboose to our site, it has undergone a major transformation. X746 was built in 1930 by the Great Northern Railway at its St. Cloud, Minnesota shops. It was operated by the GN until sold to the McCloud River Railroad in August of 1956 (the Great Northern's Bieber line formerly connected with the McCloud River at Lookout, CA). Renumbered #34 by McCloud River, it was equipped with brass whistles for the long back-up moves required due to the switchback between McCloud and Mount Shasta. The caboose stayed in service until 1963 when it was retired. It was then sold for $25 to Mt. Shasta resident Jim Nile who moved it to his property a short distance from the McCloud tracks a few miles east of the city of Mt. Shasta. For many years it functioned as a family cabin. Several attempts to sell or donate it to preservation groups or individuals failed. Over time it fell into disuse and disrepair, suffered considerable snow and rain damage, and was close to being considered unsalvageable when an agreement to bring the caboose to Black Butte was made in late 2006. We have never found a photo of the X746 in its GN paint. Here are some photos of it while on the McCloud River on Jeff Moore's website. 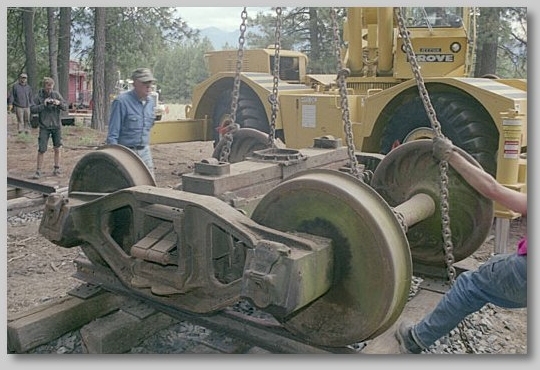 The caboose was moved to Black Butte in June, 2007 with the assistance of the Carlton Crane Company of Burney. This was a major logistical operation, involving bulldozing a pad alongside the caboose for the crane, limbing up many overhanging branches, and building a section of track for the caboose at Black Butte. The Weed Press covered the move in an article in June, 2007. At the time of the move, it was questionable whether X746 was too far gone to be saved. The main roof and the cupola roof were both caved in. Floorboards and some of the siding was rotten. Interior cabinets and closets had basically become huge wood rat nests. We were even worried whether or not it could survive the move without completely falling apart. Black Butte volunteers Toby Hardman, North Bank Fred, Lee, and Broke Toe Rezo assisted greatly with the initial rehabilitation, helped along by a large number of other friends and volunteers. In the Fall of 2007 we tore off the roof and completely replaced it. This included milling major supporting beams and the curved rafters that makes a wooden caboose roof unique. For photos and additional info on this phase of the process see "GN caboose X746 rehab 2007". Over the next two summers, the rehabilitation process continued. Insulation and a new tongue and groove wood ceiling were installed in both the cupola and main cabin. Floor supports were shored up and a new plywood sub-floor added. Some replacement exterior siding and a hardwood floor were added, all using donated recycled lumber. Several windows were rebuilt and installed. There was a huge amount of detail work involved, including siding the cupola exterior, replacing window trim, etc. For photos and additional info on this phase of the process see "GN caboose X746 rehab 2008-2010". 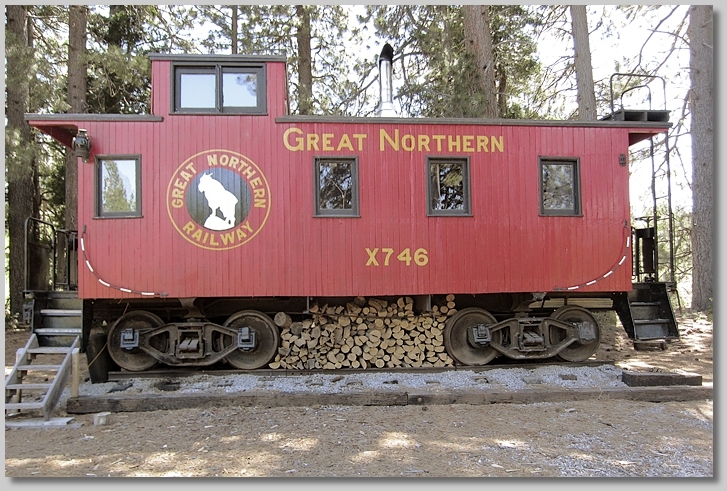 In 2010 the caboose was repainted in its original Great Northern color. Members of the Great Northern Railway Historical Society (www.gnrhs.org) were very helpful in providing information on restoring wood cabooses in general and in providing technical information regarding paint and appropriate lettering. 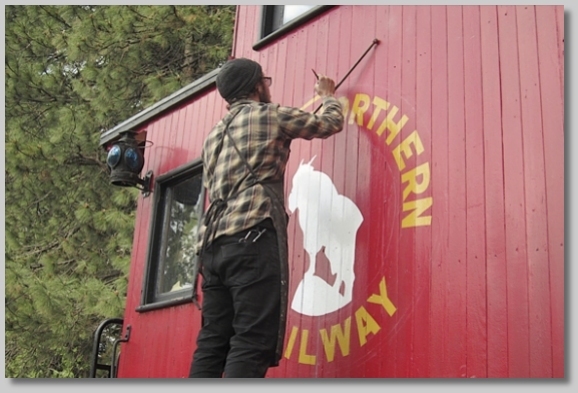 In 2011 we began the final exterior work on the caboose — restoring the lettering and heralds. 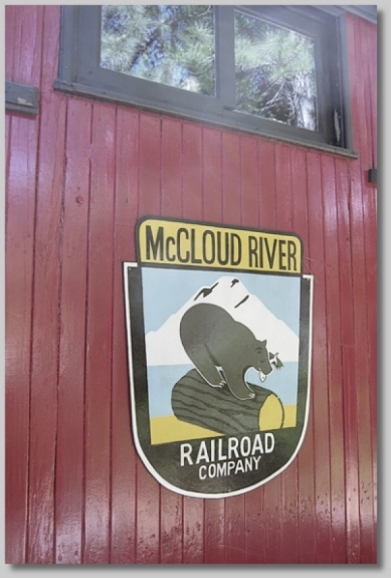 We chose to honor the caboose's two-railroad heritage by lettering it in its original Great Northern paint scheme from 1930 on the west side and the ends and to letter it for McCloud River Railroad on its east side. BBCRC "artist in residence" Shannon Knox produced a reproduction of the original McCloud River shield in 2011. The remainder of the lettering and painting is happening in 2012. Bay Area sign-painter Ken Davis applied the GN "billygoat" herald and lettering in June, 2012, bringing the whole rehabilitation process close to completion. For more info on Great Northern cabooses see our Links page.